When you look for mufflers, be sure to comparison shop as this will give you an apples to apples comparison of each brand. Further, by researching each of the top manufacturers you can find out which model will be the best fit for your ride. Comparison shopping can also help you determine which stores carry the parts at discounted prices. For those looking for the best performance mufflers, you cannot go wrong with these five. 1. Flowmaster mufflers are outstanding as they provide excellent performance for drivers. They come in a wide variety of types that can accommodate everything from a small four cylinder engine car to an RV. Best of all, they tout great benefits for your vehicle such as better fuel efficiency and greater torque. 2. Another excellent brand of performance mufflers comes from Magnaflow. Magnaflow mufflers feature a steel mesh, which helps to regulate temperature and reduce sound. Additionally, these are built for durability as the heavy stainless steel body can handle the rigors of driving. 3. If you are looking to buy from a leading manufacturer then you should look no further than Gibson exhaust. They have been a leader in producing exhaust equipment. With innovative features that will reduce RPM, drivers will love the improvements their ride will have with Gibson products. 4. When comparing muffler prices one brand that is very appealing is Dynomax. 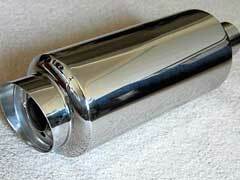 They have an excellent selection of performance mufflers which include their Super Turbo model. This part improves flow thereby improving the power of your vehicle. Further, the fiberglass technology helps to absorb interior resonance, which in turn will produce a mellow sound. 5. Lastly, MBRP makes mufflers drivers will love. They design these to provide excellent exhaust flow that will also deliver a high performance sound. They accomplish this sound with stainless steel wool that is tucked into a ceramic fiber blanket. The result is a mellow sound drivers will enjoy.